Have you been to our website recently? It has plenty of great information about the area, things to do, and you can even book your stay when you make the great decision to come up to Big Bear Lake for a vacation. One thing you may notice that is fairly new: our Certificate of Excellence from TripAdvisor as one of the top places to stay in the Big Bear area! We want to thank all of our guests for helping us earn this award. If we have never had the pleasure of having you as our guest or it has been a while since you stayed with us, now is a great time to visit with us. There are so many things going on up here, this summer would be a perfect time to get to know us again. The weather has been very cooperative as well. One of the great things about our cabins is their location. Big Bear Frontier is just half a mile away from the stores and restaurants in the Village, two miles away from Snow Summit and all of its four-season activities, and we have great access to the lake. In fact, we have our own private access point to it! 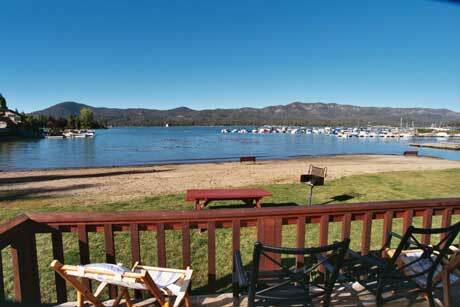 If you want to go out on the lake, we are also located close to Big Bear Marina, where they have Action Aqua Flight! and the Big Bear Queen for all of your needs for a day on the lake. And at the end of a long day, being a little bit closer to all these activities is a good thing! When you come up to Big Bear, it should be a family affair. We know that many of your pets are as much a part of the family as your children are. There are plenty of cabins and hotel rooms we have that accommodate your four legged friends. Just make sure you let us know when you make your reservations, and we will make sure we set some room aside for your pet. We are not the only ones; Nottinghams Tavern, B’s Backyard BBQ, and many of the shops in the Village like them as well. A total family vacation! Over the last six months, we have been working hard to make improvements to the property. We hope you were able to see the gorgeous summer flowers we planted, but that is not all! Our WiFi covers all of our cabins and hotel rooms, and we have repainted and refinished most of the exteriors of all the buildings. We are also working on deals for our guests with local hot spots, like The Cave. We are constantly working on every aspect of making your experience as a customer better. Great ratings like we have been getting don’t just make themselves! Let us know about your stay through our guest surveys or on Facebook and Twitter. Thank you again for making us one of the best places to stay in Big Bear! Now that everyone knows, rooms will be going quickly. You might want to reserve yours now. We’ll see you soon! Gallery | This entry was posted in What to see and do and tagged Bear Mountain, Big Bear CA, big bear lake, big bear mountain, biking, boating, book a room, cabins, Certificate, Certificate of Excellence, comfort, cycling, events, family, fishing, fun, getaway, hiking, lake, mountain, places to stay, relax, Snow Summit, summer, travel, TripAdvisor, tripadvisor award, What to Do. Bookmark the permalink.